The popularity of online videos leads to the topic of this post- you will need a good free video editor for Mac to make your personalized & unique clips. Here we have the top picks for the best free Mac video editor with no watermark, no trial period, and with basic and advanced editing features to cover your needs. Best free video editing software for Mac beginners, but also powerful enough for video parameter editing. Actually, most video editors offer a free trial with limited features for a limited period. In contrast, a totally free editor will make more sense. At this point, macXvideo, a light and 100% free program, will be the best software for Mac to edit MP4, MOV, MKV, AVCHD, MTS etc. The software is an industry standard solution for 4K footage editing on Mac, packing the powerful editing features all under an innovative Mac-style interface. Save edited videos to any popular formats, including editing videos for YouTube, FaceBook, Instagram, iPhone X, 8/Plus/7, iPad etc. It's a 100% free 4K footage editing software for Mac (macOS High Sierra, Sierra, El Capitan, etc. incl.) without watermark or other limits. Free edit features- crop, trim, merge, add subtitles/watermarks, split videos etc. Reduce large HD/4K MKV, AVCHD, MTS etc to smaller size with no quality loss. Convert video among MP4, MOV, H264, AVI, MKV, MP3, iPhone Ringtone, etc. Edit Videos for YouTube, FB etc. Edit videos on Mac to format, resolution, size for YTB, FB, Vimeo, Instagram, etc. Adjust parameters, bitrate, frame rate, aspect ratio, sample rate, channel, etc. Powered by GPU acceleration, achieving a 5X faster speed than any others. Step 1: Download macXvideo on computer and launch it. Then click add button to load the video you'd like to edit. Step 2: Basic editing buttons such as cut, crop, effects, etc are clearly shown on the main interface. Just click whatever icon you want to enter into the editing page. You can also click the setting buttons to adjust the video parameters to further compress video files for example. Step 3: Change the format if needed. If you want to upload your video to YouTube, FaceBook, or transfer to iPhone, iPad or other mobiles, select the suitable format. If you're not clear which to choose, MP4 will be your best bet. Step 4: Click Run button and the program will apply all the editing to the video. There is no quality loss or watermarks. Note: The interface and the operation to edit videos on Mac are extremely simple. Here is a detailed guide on how to edit GoPro videos, which will show you how to trim, compress, add sub/watermarks and more step by step. Apple's default video editor is best for basic editing on Mac. Apple provides iMovie completely free for all Mac computers running on macOS 10.11.2 or later. It has all the necessary tools to make great home movie from a set of video clips, like clip trimmer, precision editor, parameter adjustments, shots stabilization, audio mixing and more. On the top, also iMovie edits 4K and 1080p60. 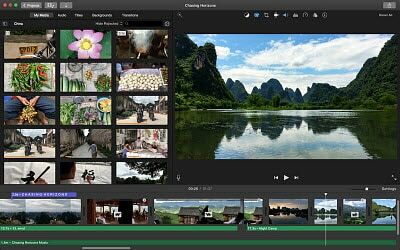 Though iMovie is clearly not made for advanced editors, the software is a good choice for novice and amateur video makers. Plus, you can get it download free on iOS-based devices - let that be iPhone X/8/7, iPad Pro/Air or iPod. A renowned editor has a free version that is more professional than most of others. 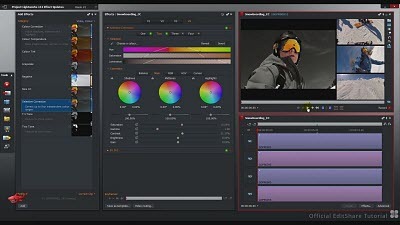 Lightworks Pro version requires £14.99 per month, but there is a free version which comes with everything you can expect from any excellent free Mac video editing software, and even a slew of powerful editing features that are available only on paid editing solutions- including audio manipulation, color correction, real time effects, titles, multi-camera editing, etc. Being powerful enough to stay in the same league as paid ones, the software is lightweight, requiring 200MB of storage space and 2GB of RAM to run. But you're limited to edit videos for YouTube 720P or Vimeo 1080P only. Choices of other common formats or 4K, 3D, Blu-Ray is offered for paying users. Key Features: HD Support, Non-destructive editing, storyboard mode, unlimited video tracks and audio tracks, Linear timecode display. Edit video on Mac with professional editing tools but at no cost. Da Vinci Resolve is a popular name in the professional film production. The Studio version of Da Vinci Resolve costs nearly $1,000, but a completely free basic version. As a complete package, the free Mac video editor without watermark features tons of Pro functions, including professional tools for editing, color correction, audio post production for SD, HD and Ultra HD at up to 60fps. The differences between the free and paid versions, like the lack of some collaboration and workflow tools, have little influences for it being pro yet free 4K footage editing software for Mac. Key Features: Color correction, built-in editor, color grading, facial recognition, hardware acceleration. The open source program offers more than just a free video editor for macOS. The open source Blender is more of free animation software which is famous for 3D modelling and compositing. But it's actually a capable non-linear editing software providing a slew of editing features like transitions, speed control, filters, adjustment layers, etc. For beginners, the available features can be a bit overwhelming. But if you have learned how to use it, you can create animations or games in professional quality. Blender is totally free and surely will be worth a shot. You can edit videos without watermarks, or other limitations. A handy free Mac footage editor for basic editing and encoding. Avidemux boasts functionalities to add logo, rotate clips, and crop, cut and copy a section of videos, fade in and out, adjust video color, brightness, add hardcoded subtitles and do more. The Mac editing freeware has no watermarks or other limits. It's ideal for basic editing tasks. Plus, the program serves as a good video editor for MP4, mkv, flv, mpeg and numbers of common digital formats. It's the best choice to make quick edits particularly for YouTube, FaceBook, Instagram or other specific purposes. Key Features: Cutting, filtering, and encoding tasks, support common input and output formats, video filter manager. Bottom line: From the above, which is the best for you? That depends on what you would like to do with your clips. 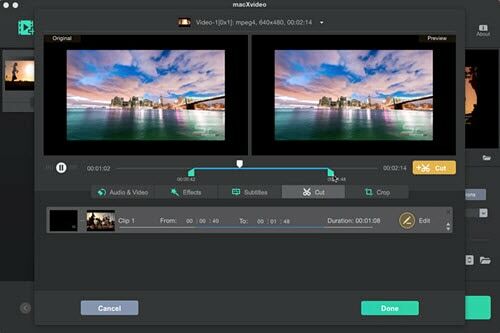 In short, if you want to edit videos on Mac for social sites, macXvideo has the easiest solution. To make Hollywood-style home movie, iMovie is your best bet. 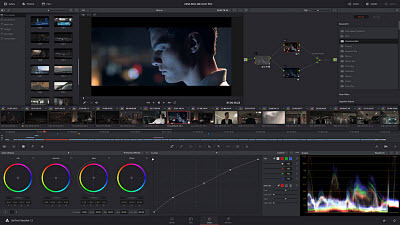 For advanced users, Lightworks and DaVinci Resolve are both your hands-down best option. 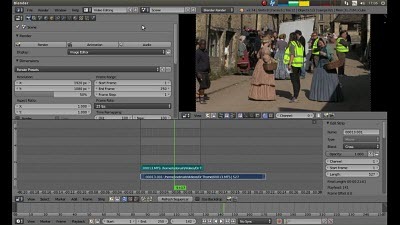 Blender will well fit your 3D editing and creation, where Avidemux will make a good and basic free editor on Mac. • Download online HD/4K UHD music/movie videos from YouTube, and other over 300 websites. • Convert any downloaded or shooted video to MP4, AVI, MOV, iPhone, iPad, Android, etc. • Offer basic footage editing features and support virtually any formats, with no time limit. • Make slideshow and record screen activities with high quality. • Support Intel QSV and Nvida NVENC HW accelertaion boost video encoding speed to 5x faster. [Tutorial] Cut and trim down video length into smaller pieces. This is the tutorial to rotate a video to make it in the right way. Best Video compression software for Mac to shrink video.